The Cleveland Cavaliers recently engineered the greatest second-half comeback in NBA playoff history when they rallied from 25 down at the half to beat the Indiana Pacers 119-114. Amazingly, that broke a record that stood for nearly 70 years, ever since the Baltimore Bullets came back from 21 down to beat the Philadelphia Warriors 66-63 in the 1948 NBA Finals. Philly’s leading scorer Joe Fulks helped matters by continuing to shoot — and miss. And the Bullets helped themselves by driving to the basket for good shots. The home crowd sat stunned. The Bullets cut the gap to 48-40 in the third quarter. Then, in the last period, it was all Baltimore. “We were up by one with four seconds to go, and I tipped in a missed free throw,” Bullets forward Paul Hoffman recalled. Connie Simmons led the Bullets with 25 points that night, Hoffman had 12 and Kleggie Hermsen 10.Joe Fulks led the Warriors with 27, most of them in the first half. The Bullets went on the win the series in six games for their only NBA championship. The Bullets were, in effect, an expansion team in the 1947-48 season having come over from another league, the American Basketball League to the Basketball Association of America, which would become the NBA beginning in 1949. 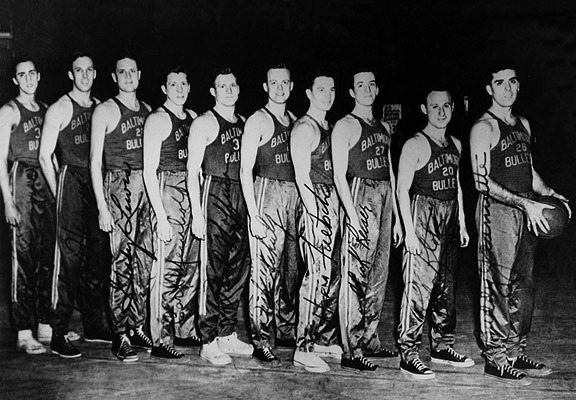 The Baltimore franchise folded in 1954, and the Bullets remain the only defunct team to win an NBA championship. The Baltimore Bullets returned to the NBA in 1963, after two years in Chicago as first the Packers and then the Zephyrs. They became the Capital Bullets in 1973, the Washington Bullets in 1974 and the current Washington Wizards in 1997. The Bullets beat the Seattle SuperSonics in seven games in 1978 to win their only NBA title. The Cleveland Cavaliers are swimming upstream against history. No team has ever come back from a 3-1 deficit in the NBA Finals to win a championship. And only three teams have ever won a seventh game on the road. For just the third time in history, a team has forced a seventh game after trailing 3-1 in the NBA Finals. That would be the Cavaliers, who will go to the mat against the Warriors on the road in Oakland. 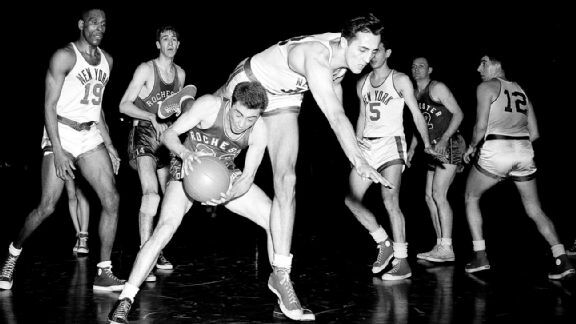 In 1951, the Knicks trailed the Rochester Royals 3-0 and rallied to force a Game 7 but lost 79-75 in the final game (shown above). Arnie Risen led all scorers with 24 points as Rochester won its only NBA Championship. The Royals later moved West, first to Cincinnati, then Kansas City-Omaha, and eventually Sacramento. Somewhere in transit they become the Kings. In 1966 the Lakers trailed the Celtics 3-1, only to win twice and force a decisive game. Boston held on to win that game 95-93 at the Boston Garden and capture a record eighth straight NBA championship. Bill Russell scored 25 points and took down 32 rebounds to lead the way. Seventh games are a rarity in the NBA Finals. Cleveland-Golden State is just the 19th Game 7 since the league’s first playoff in 1947. Since 1984, only six Finals, including this one, have gone the distance. And the home team – that would be the Warriors – has the decided edge if history proves true to form. Only three teams have won a seventh game game on the road. The last team to win a Finals Game 7 on the road was the Washington Bullets, who beat the Supersonics in Seattle. The Bullets won 105-89 behind center Wes Unseld, who was named MVP. The Celtics did it twice – in 1974 against the Bucks in Milwaukee and.in 1969 against the Lakers at the Los Angeles Forum. In 1974, the road team won five times, including the last four games. The Celtics won 102-87 in what turned out to be Oscar Robertson’s final game. In 1969, Boston, which finished in fourth place in the Eastern Division, came back to take the last two games as Russell outplayed Wilt Chamberlain. Boston held onto what had been a 17-point lead in the finale to win its 11th title 108-106. Jerry West became the only player on a losing team to win Finals MVP. LA owner Jack Kent Cooke had thousands of balloons in the rafters ready to be released when the Lakers won. The balloons never came down. 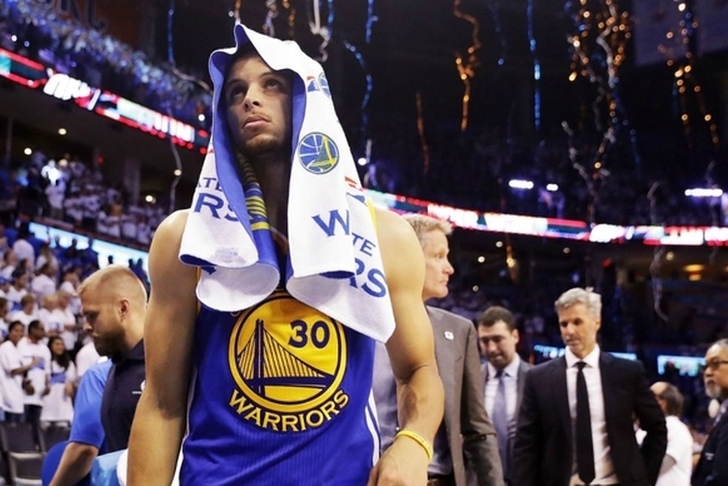 Well, well, Stephen Curry and the Golden State Warriors are in a pickle. The Dubs set an NBA record with 73 victories, but unless they are able to stage a miracle comeback against Oklahoma City in the Western Conference finals, they’re toast. And if they lose to the Thunder (or somehow make the Finals and lose to Cleveland), the Warriors will have no claim…none… to the title of NBA’s best team ever. It happens. In 2007, the New England Patriots finished the regular season unbeaten at 16-0 and yet lost to the Giants in Super Bowl 42. In 2001, the Seattle Mariners won 116 games, tying the 1906 Cubs for the most in MLB history. The Mariners were knocked out by the Yankees in five games in the ALCS. And the Cubs lost the 1906 World Series to their crosstown rivals, the White Sox, aka the Hitless Wonders. In the NBA, teams with outstanding regular season records generally go on to win the championship. The 1996 Bulls (72-10), 1972 Lakers (69-13), 1997 Bulls (69-13) and 1967 76ers (68-13) were all crowned champs. The best team not to win a title was the 1973 Celtics (68-14), who lost to the Knicks in a seven-game, Eastern Conference Final. The Warriors won the NBA title last year following a 67-15 regular season, tied for seventh best all-time. The 1986 Celtics, 1992 Bulls and 2000 Lakers all won championships after finishing 67-15. The 2007 Mavericks and this year’s Spurs also went 67-15, but were knocked out before the Western Conference Finals. The Washington Capitals were 49-11 in 1947, the NBA’s first season, but lost in the semifinals. In the NFL, the 1984 49ers and 1985 Bears both finished 15-1 and won the Super Bowl. But three others teams, the 1988 Vikings, 2004 Steelers and 2011 Packers, were beaten before reaching the Super Bowl. In addition to the Mariners and Cubs losing the World Series, the 1954 Indians (111-54) and Philadelphia A’s (107-45) in 1931 were also upset. The Canadiens set an NHL record with 132 points in 1977 and won the Stanley Cup in the midst of a four-year championships run. But the 1996 Red Wings, with a record 62 wins and 131 points, were derailed by the Avalanche in the Western Conference Finals.